In 2005, traffic was ground to a standstill when a salt stain said to resemble the Virgin Mary appeared at the Fullerton Underpass. This wasn’t the first time such a thing had happened – and another time it not only attracted what may have been an even bigger crowd, but turned out to be the result bouncing off the window in the home of a former gangster! 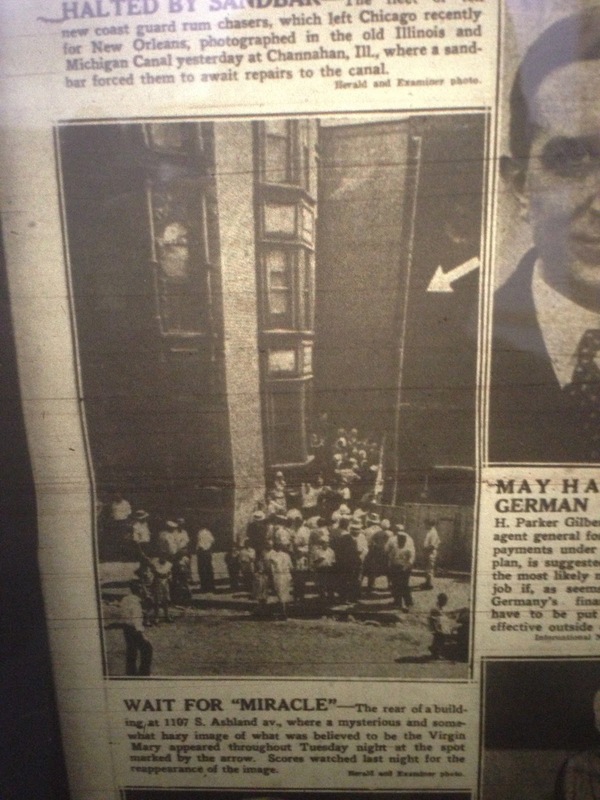 In mid July, 1931, a man walking down Ashland noticed a glowing image that resembled Mary and the Baby Jesus on a brick wall at 1105 S. Ashland, just near Roosevelt Road. He fell to the ground in devotion. Another guy nearby though he had fainted and ran to help, then saw the image and knelt down himself. 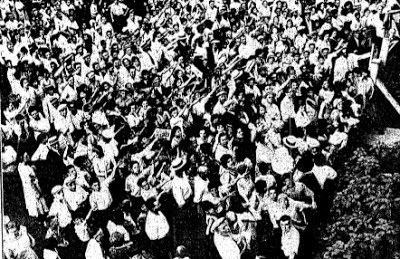 Within hours, the crowd had gotten so big that 400 police officers had to be brought in; some papers say that 50,000 people filed past to see the mysterious image, including several hot dog and ice cream vendors. 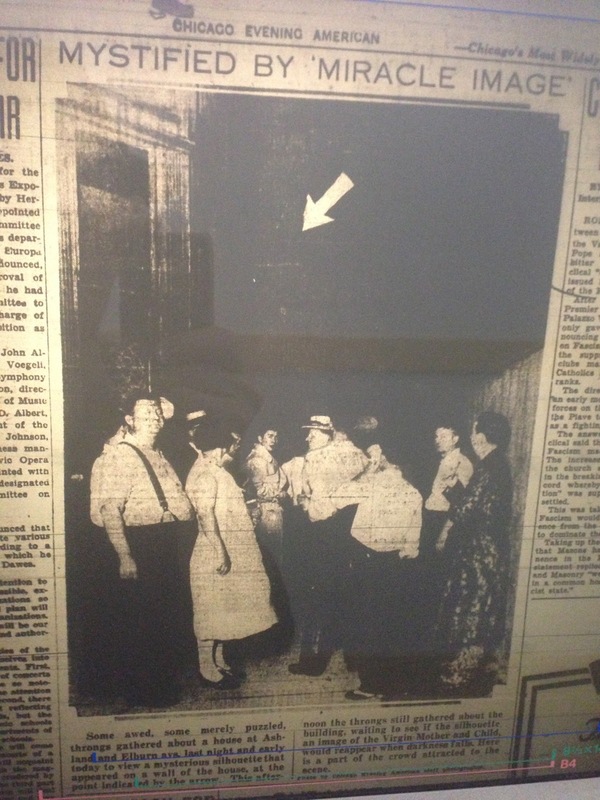 There’s some newsreel footage out there someplace, and a lot of shots of the crowd, but I don’t think the image photographed well; all I could find in the newspaper archives down at the library was some pictures of the wall space where it was supposed to appear. The newspaper men seemed, to a man, not to think there was anything holy about it, and most just saw dim light, not something that looked like Mary unless you were really looking for it (not unlike the salt stain – I couldn’t never tell what they were looking at there myself), but were still unable to figure out what the source of the light could be. On the second day, they were scraping it with knives trying to see if it was just phosphorescent paint – but to no avail. The image remained, glowing brighter as the night got darker, and the “miracle” was reported in newspapers around the country. On the second day, though, the mystery was solved – the image a street light that was bouncing off a window across the street, being distorted into its odd shape by a lace curtain on the window. To what must have been everyone’s great surprise, the police knocked on the door of the flat where the window was located and found it was the home of Sam Genna of the Genna Brothers, the gang that had controlled Little Italy until three of Sam’s brothers were killed in rapid succession a few years before. The police, no longer afraid of the once-notorious Genna Brothers by 1931, pushed right past him, despite Sam’s protestations that he had company, and despite the fact that such an unwarranted search was not remotely constitutional, and firmly established that moving the curtain up and down could make the “apparition” appear and disappear. The police announced to the crowd that it was all a “big fake,” and the crowd dispersed. Sam Genna lived relatively quitely for the next twenty years until his death of natural causes. At the left here is the Tribune’s shot of the crowd, which they estimated to be around 7000 at the time the photo was taken. I’m not sure that providing a rational explanation like that would make so many people disperse so quickly these days – the shrine around the spot where Our Lady of the Underpass appeared is still there today, going on eight years later. At least a large handful of such a crowd now would probably stick around saying unkind things about scientists and skeptics. Lt. Joseph Pierott’s announcement that everyone should go home and go to bed or he’d “run them in” would surely be seen by some as anti-Catholic suppression. The talking heads and pundits would have a field day. BTW – here’s the inside of the Genna Brothers’ tomb at Mount Carmel; Tony Genna’s crypt is on the lower left; he was shot at Grand and Aberdeen in 1925, at a grocery store that stood where the pest control place is now.